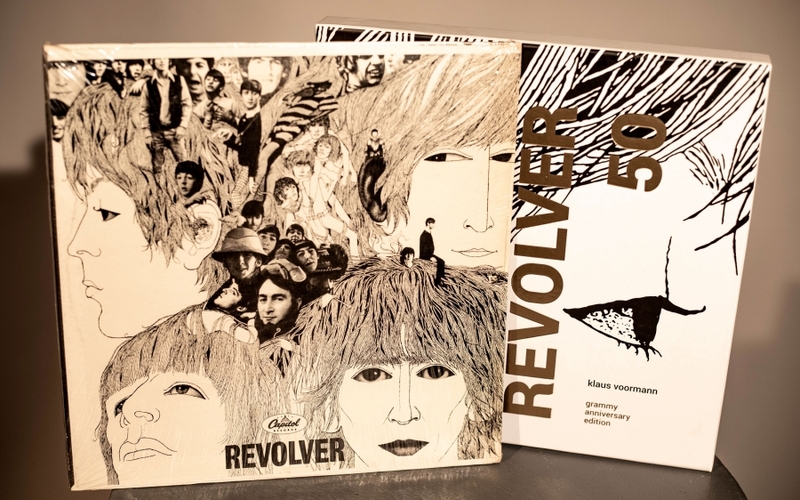 Klaus Voormann is best known for the iconic and Grammy-winning cover art on the Beatles’ 1966 “Revolver” record. 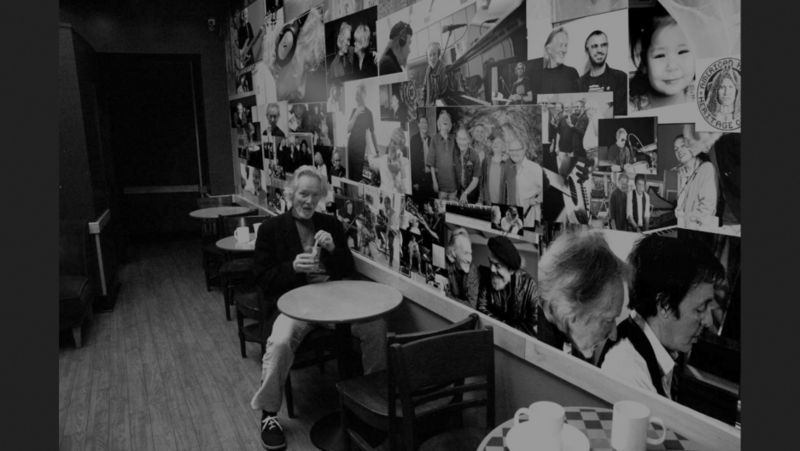 But Voormann, who no longer plays the bass, is still doing art and graphic design. His exhibit “It Started in Hamburg” opens Oct. 30 at NAVEL in Los Angeles. In 1971, John Lennon asked Voormann to play the bass on his “Imagine” record. The Beatles broke up publicly in 1970 and Voormann soon became the de facto bass player for John Lennon. He spoke with Marco Werman about the record and about his art. 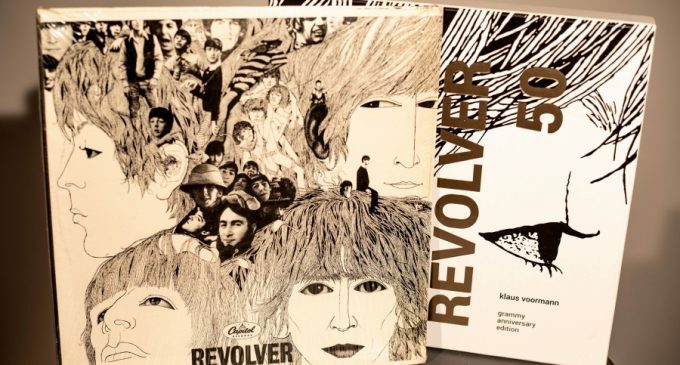 Klaus Voorman did the cover art for the Beatles’ “Revolver” record. 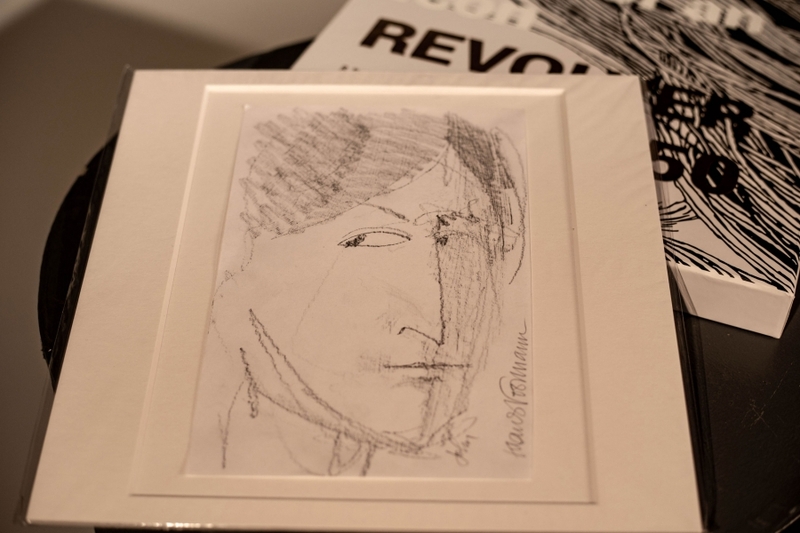 Marco Werman: Klaus Voormann, what was it like working on that album with the shadow of the Beatles breakup so close by? Well, to me there was no shadow because I knew each member really separately. I did not see them as a unit in those days because it was gone. You know, the whole magic of Beatles was gone, which people didn’t really realize because I saw the inside and I could see that those people just couldn’t stay together forever. So Paul McCartney was the bass player for The Beatles for so many years. Was it liberating for you to come in as the new bass player on “Imagine” or was there any psychological baggage that came with that? I never thought of it and plus, my bass playing is so different and it fitted to what John wanted to express. So I never thought of it. I just want to ask you one more thing about the “Imagine” sessions. The title track, the song “Imagine,” was finally co-credited to Yoko Ono last year. John Lennon said at one point before he died, that at the time, he took solo writing credit because according to him, “I was a bit more selfish, more macho. I sorta omitted to mention her contribution,” referring to Yoko. I don’t want you to kiss and tell, but what did you see of John Lennon at that time that suggested he was more selfish or more macho? Yes, he was. And I actually think it’s right that he gives credit to Yoko because most of the things he’s done in those days were really coming very much from him and Yoko. Those two were a unit and a great unit and it’s only fair that he gives credit to Yoko. So these were the immediate post-Beatles years when “Imagine” came out and was produced. I want to swing back to their roots a decade earlier in Germany because this is kind of your story now, Klaus Voormann. You and your friends caught the Beatles, you saw them when they were just an unknown Liverpool rock n’ roll band playing in Hamburg. Were you making music yourself when you saw them? When I was a kid, I played a lot of classical piano. That was my musical background. But when I saw rock n’ roll and I heard rock n’ roll, I never thought that I would eventually be a bass player and play — it didn’t even cross my mind. What did you think when you saw The Beatles for the first time in Hamburg? Well, I thought it was so amazing that those young kids — they were completely unknown. George, who was just 17 and he was just lovely. You know, he was lovely, cuddly. John was great, like everybody knows. And Paul was fantastic and Pete Best was playing the drums in those days and Ringo wasn’t around. This was post-World War II Hamburg. I know there was a US military base nearby or an allied military base rebuilding Germany and Europe. Remind us, though, why Hamburg had this lively rock n’ roll scene in the ’50s. Well, you see, Liverpool and Hamburg, they’re both seaports and you have sailors, you have ships, you know. So the kids in Germany, when you went for example to a fairground you heard rock n’ roll music. So it was eventually necessary that they had rock n’ roll music live and that was a great idea of this [Bruno] Koschmider guy who was the boss in the Kaiserkeller and the Indra Club. That’s the first two clubs the Beatles played and so, he got those bands from Liverpool over and the kids were coming and wanted to see the band. What do you listen to these days when you want to listen to music? Listen, it’s completely different now. I can easily listen to Glenn Gould playing Bach or just the other day, I got out an old cassette where you got Larry Williams and all those rockers on it. I still like to listen to it. Do you still play the bass yourself? There’s nobody around here which I would want to play with. You see, I’m spoiled. I mentioned your fantastic work on The Beatles “Revolver” album. The artwork, the pen and ink drawing and collage, do you still paint, do you still work in the visual arts? Well, I actually still do graphic arts and I love doing it and I just have an exhibition which now is going to come to Los Angeles and this is a really great event which is going around which started in Hamburg and now it’s going to go to LA. It’s very very good. I’m going to put you on the spot here with the one with one final question. We know your name from the “Revolver” album. At the concert for Bangladesh, George Harrison called you out along with Jim Keltner, but I don’t know what you look like. Can you tell us what you look like today? Maybe a little bit Kris Kristofferson but I don’t look as tough. I look a little more delicate, I would say. I’ve got gray hair, sometimes I wear glasses but most of the time not, only if I have to read something. I’m thin and I’m 176 cm high.